Ever since I first started traveling, I have loved postcards. And I mean my very first trip, all the way back when I was a teenager and I went to Rome. 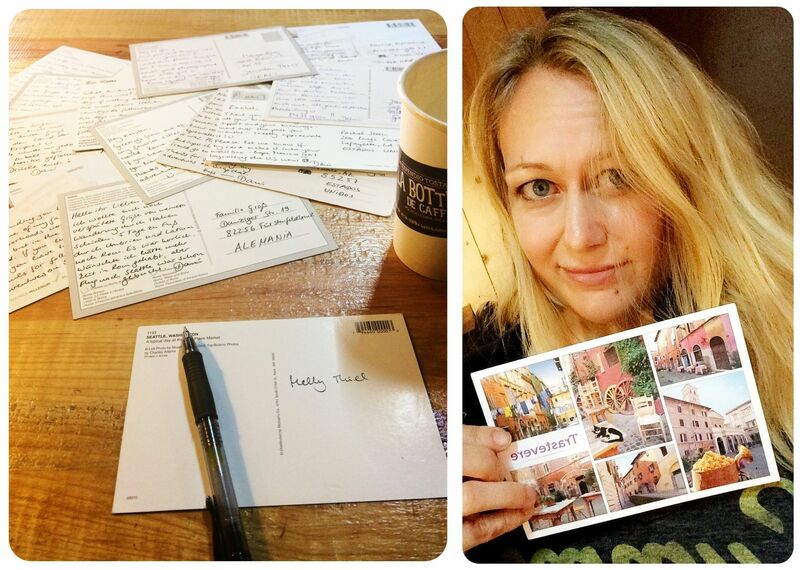 I loved sitting down to write postcards, writing as small as possible to fit as much as I could on the card. Writing out every tidbit about the trip that I felt I needed to share. And to this day, this hasn’t changed. No matter where I go, I always pick up a bunch of postcards to send to family and friends. I personally love it when I go to the mailbox to get my mail and a colorful postcard peeks out between a pile of white envelopes, usually holding boring stuff like bills or bank statements. And I hope that the recipients of the postcards I send feel the same way about them. Why is nobody sending me postcards anymore? 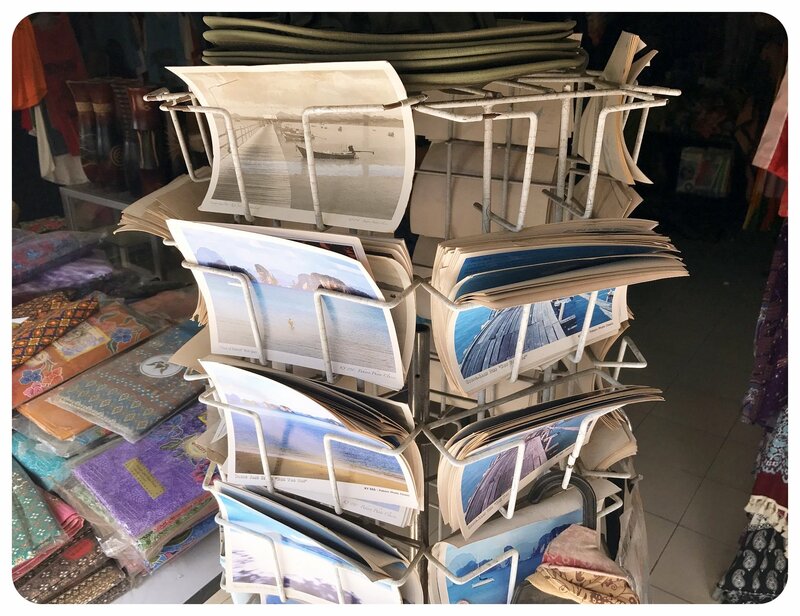 The whole concept of sending postcards has changed quite a bit since I sent those first postcards back in 1993 though – especially in recent years. It’s become rarer and rarer that I receive postcards. It seems like since people started traveling with smartphones it has become much more common to send a quick WhatsApp or text message instead of investing in an actual paper postcard, making the effort to go and buy a stamp, and to find a letter box to send it (which, let me tell you, isn’t always easy, as I learned last month when I walked through rural Spain and tried to post some postcards in smaller towns). I get it. A quick message with a picture snapped on your phone is much more convenient. It’s easy. You can even do it from your sun chair by the pool, instead of having to deal with the hassle of going to find a post office. But it’s definitely not the same as getting a postcard, which you can hold in your hand, reading it with a smile on your face. A vacation SMS is just that: anther text message. And we all get plenty of those. A while back, however, I saw something interesting on my sister’s pin board. My sister-in-law had sent a postcard that she had created herself, featuring my nieces, showing how they were enjoying their vacation. And she did it all in a postcard app, which is easy and intuitive to use. I loved the concept instantly. What’s better than receiving a postcard? Receiving a personalized postcard! Another reason why I thought this was genius was the fact that in recent years, I’ve noticed a steep decline in places selling eye catching postcards. I remember how last year in Colombia, I couldn’t find any decent postcards outside of Cartagena. In Ecuador it was similar – other than in the Galápagos Islands, I hardly came by any postcards. But even tourist hot spots don’t always offer postcards that I would want to spend money on. When I visited Rome last year, I was amazed to see that most of the postcards on offer were still the exact same ones I sent from there on my first visit, over twenty years ago! New York City is also really slow in adding new postcards to the ones already circulating, and most of them are super cheesy. And this is why I think sending postcards will become more and more an app-based affair. We all take pictures with our cell phones already, and with those, we can create a much more personalized postcard than a store bought one that anyone could replicate. I found this to be especially true when I walked the Camino de Santiago last month. As usual, I picked up a bunch of postcards along the way to send to friends around the world. But when I took them out in a cafe one day to write them, I saw that most of them didn’t really represent my own experience of walking The Way. Bright red Poppy flowers in bloom? I walked the Camino in the late summer. Green meadows in the central plateau? When I walked through that region, after a hot and dry summer, the area was the color of sand. 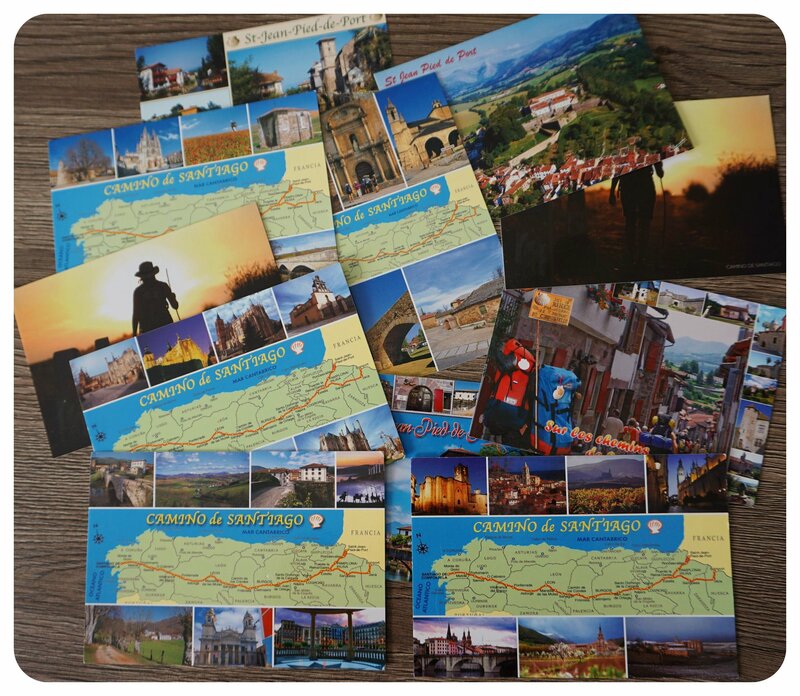 My Camino experience looked quite different than the pictures shown on the postcards I had bought. 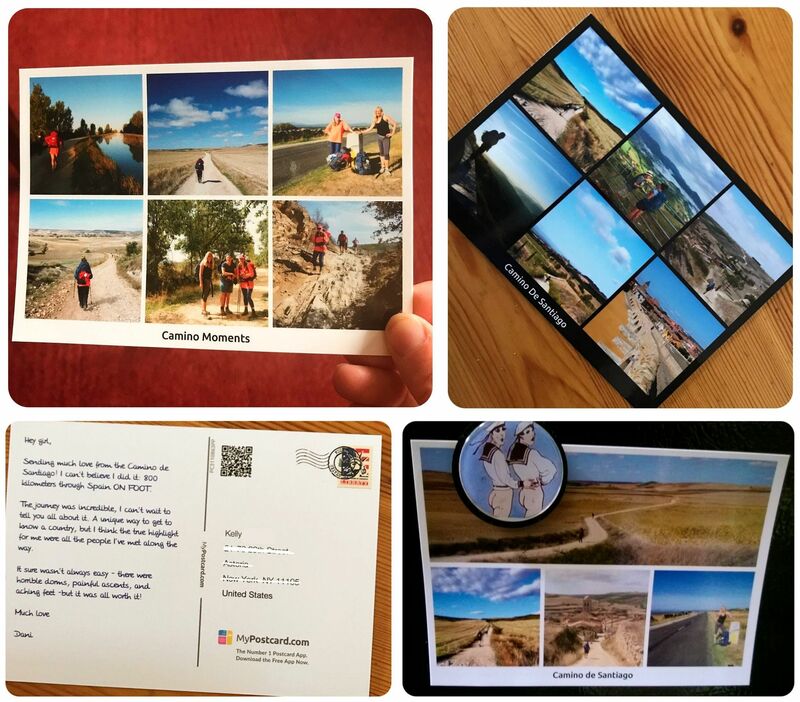 Call it serendipity, but I learned about the MyPostcard app just as I was walking the Camino, a trip that couldn’t have been more perfect to send personalized postcards from. The app is very easy to use – you click on ‘Send a postcard’ or ‘Send a greeting card’, and then you choose from the available styles what you want your postcard to look like. 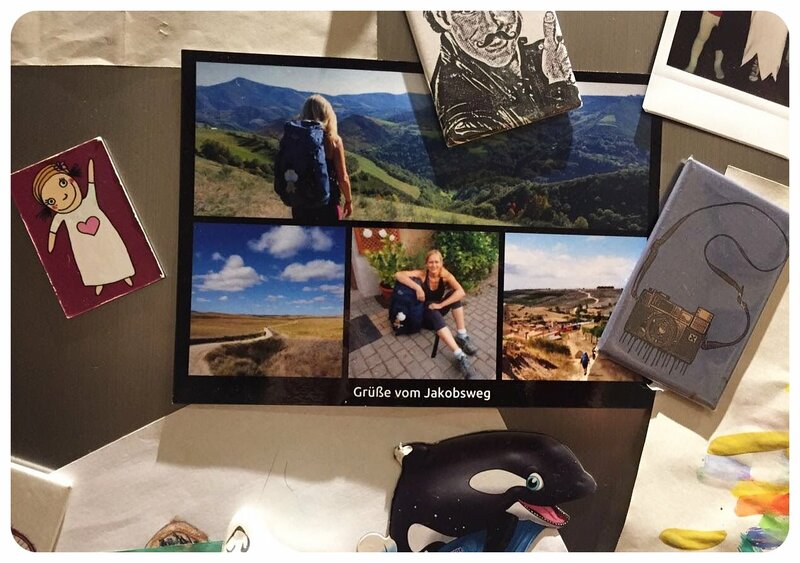 Do you just want to use one single photo for the postcard, or do you want to feature several photos? You can choose up to six photos for your postcard (depending on the style), and then simply add the photo(s) in the frame. After adding the photo(s), you can edit the postcard, by either adjusting things like exposure, contrast and saturation, or by giving the postcard a specific look by adding a filter. You can draw on the image, or add text. The finished product won’t be like any of the postcards in the souvenir shops. This postcard is exactly how you want it to look. 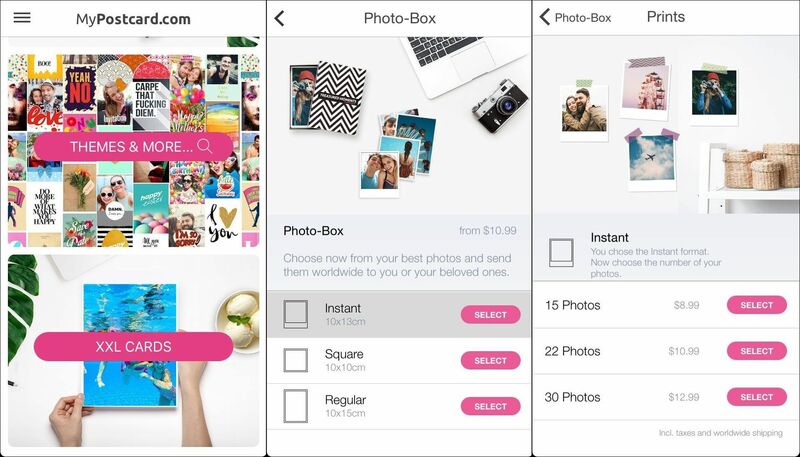 You can even upload your photos straight from Instagram, which is perfect for the postcards that feature square-spaced images. 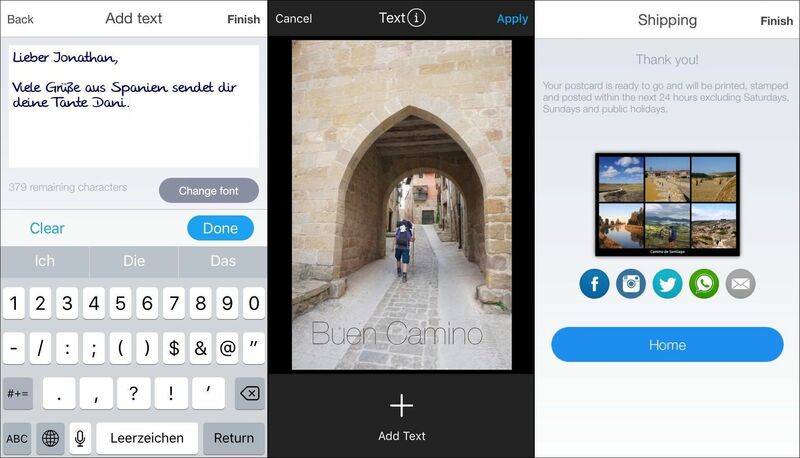 Once you’re done adding and editing your photo(s), you can add text on the front of the card – for example the name of the town or country you’re sending it from. The last thing to add is a frame you can choose (but don’t have to), and the color of the frame: black or white. After that, the postcard looks just like any postcard that you can buy in a store – only that you’re using a photo that you yourself took. After writing the text on the front of the postcard, you can now add the text on the back, just as you would on a regular postcard. What I love is that MyPostcard offers different fonts, which all resemble handwriting rather than regular print fonts, which gives it a more personal touch. And giving me various fonts made it easy for me to choose one that I felt came closest to my real handwriting. All that’s left to do is to add the recipient’s address, and then send it. 1) Any address you use is automatically saved into your address book, making it easy to use it again the next time you’re sending postcards or greeting cards. 2) If you don’t know an address, the app automatically gives you the option to request someone’s address via text message or email. It couldn’t be any easier. 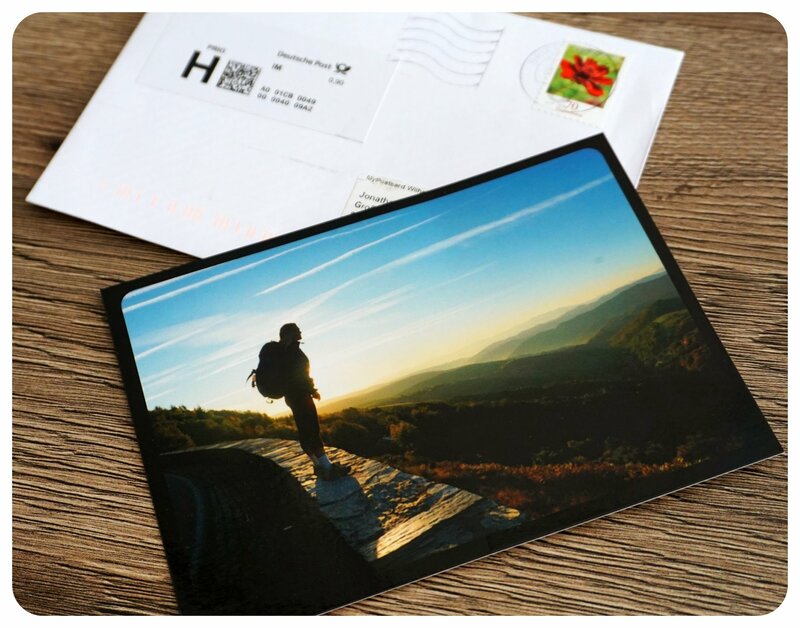 When you’re done with everything and ready to send your postcard, you’ll have the option to send it as a regular postcard or to send it in an envelope. I thought it was worth mentioning the Greeting Cards feature since the Holidays aren’t far away. Every year, I send a bunch of store-bought Christmas cards, but after looking through the Greeting Cards options in the app, I think I will make my own from now on. And not just for Christmas either. Birthdays, Graduation, Friendship, I Love You – there are lots of options in the Greeting Cards App. Yes, there are nice cards in stationary stores too, but what they are all missing is the personal factor. 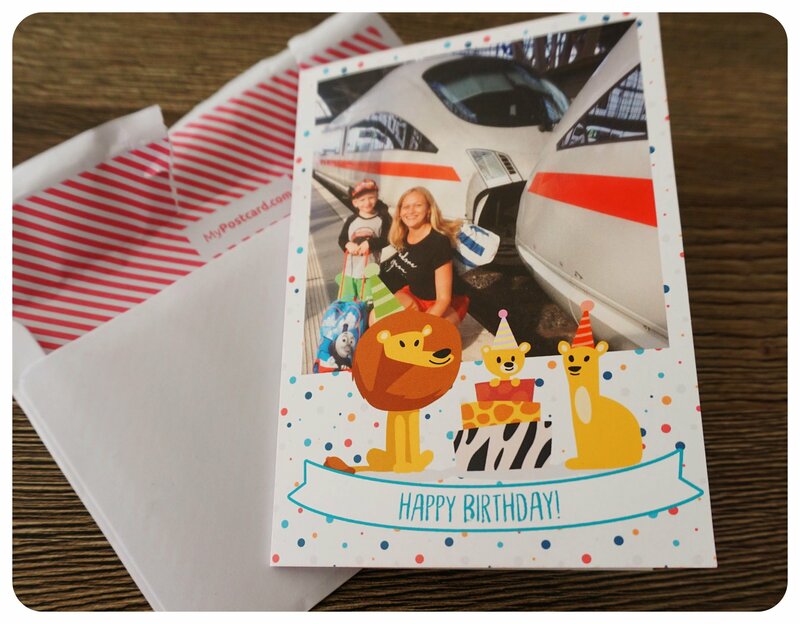 It was so heartwarming to get a teary-voiced text message after my friend received a personalized greeting card from me – if you are like me and love to gift thoughtful gifts to other people, you will appreciate this as much as I do. And the recipient of the card? You can bet that they’ll be above the moon when they get the card you made for them! Remember the times when we used to print all our photos, instead of just storing them online? Yeah, me neither. But when I visited my family in Germany last month, I realized how nice it is to have actual print-outs. First of all, not everyone has a smartphone – my brother-in-law’s grandparents came to visit us for a birthday party and they were beyond excited to look through a pile of photos of their great grand kids I had just printed. But I myself also had moments of joy when I visited my mom, and reminisced about the past by looking through some of the photo albums I store at her house. Yes, you can show some photos of your last trip on your iPhone, but it’s just not the same as looking through a bunch of actual photos instead of swiping through digital images. The prints come in a beautiful box, and you can choose if you want to have the photos printed in instant format, square format, or in regular format (10×15). At $12.99 for 30 photos, including taxes and worldwide shipping, I find the prints very reasonably priced. Send FREE postcards: I’m giving you $10 credit! When you sign up, use the credit code GLOBETROTTERGIRL for a $10 credit. You just have to sign up and redeem the credit in the account section. You can use the $10 to send a handful of postcards or to get some prints, or to send some Christmas cards! Only new customers can redeem this credit code. Only 100 coupon codes are available – it’s first come, first serve. This post was written in collaboration with the MyPostcard app. All postcards were created and written by me, and the opinions expressed in this post are all my own.